I don't think that I can say this enough times. I absolutely loved my downtown library. It was big, had lots of books, cool fountains to throw pennies in, and most importantly, the GLOBE. Whenever I would find whatever books I had planned on reading for the day, I would plant myself in one of the comfortable, cozy chairs, located right next to the GLOBE. There was something magical about that darn GLOBE. People have told me that it wasn't geographically - 100% accurate - but I neither believed them nor cared. I could watch that thing turn and turn and even when it was off of its tracks/needed oiled (notably whenever you heard the click, click, click and saw it jerk a bit with every twist), I was mesmerized by its presence. It almost looked - you know - paper mache'd although I know from looking at historical photos that it was not. I always thought to myself, one day, I'm going to go to this country or that country...and sometimes I would close my eyes and say that wherever they landed (on the GLOBE), is where I would take my very first out of country trip. Yes, I was a um...weird child ;). When the downtown library was rebuilt here recently, my biggest fear was that the GLOBE would be gone. I did see it near the front entrance. It was roped off - just like it had been years ago - but in this case, it sort of sat to the side. Makes me a bit sad that many patrons probably walk by it without even giving it a glance. 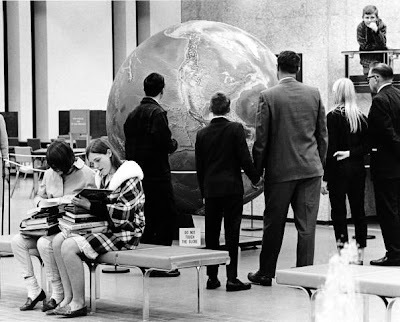 I know from historical photos that the GLOBE was given to the library from Mr. McMillen. The plaque that sits at the base says, Given to library by the boys and girls of the Wild Cat Baseball League and the Girl Scout of the Limberlost Girl Scout Council. I came home from school like I normally did - on the yellow bluebird school bus. 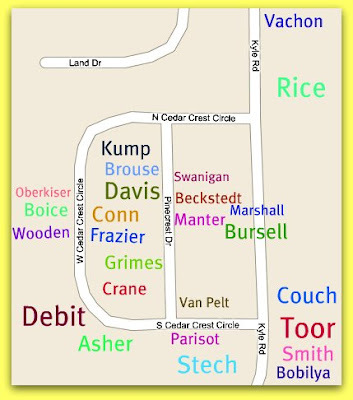 My bus stop was at the corner of Pinecrest and South Cedar Crest Circle so I had to walk a little bit to my house. As I neared my house, I saw that there was an ambulance parked in front of the Boice's house. The Boice's lived exactly - right across the street from us at 4718 West Cedar Crest Circle. During the summer time, my sister and I would play with Jackie. Jackie was nearer my sister's age (at least 1-2 years younger than me) however, her backyard was just way too awesome to let age get in the way ;). In her backyard, there were several fruit trees - apple, cherry - and some vines that grew up against this latticed fence panel. I was thinking that there were grapes and blackberries but perhaps I am mistaken. My sister Patty will probably remember though. We would always pick the apples and cherries for Jackie's mom. In turn, she would make some of the best pies ever. She used to reward us for our hard work (summertime is hot for sure!) by meeting us at the screen door, in the back, with Popsicles by Good Humor. Orange, Grape, and Cherry for the three flavors and it mattered not which of the three I had. The most important factor was that I got to have one of these yummy treats! Jackie's mom (her name - Joahn - pronounced like Joanne), was a very soft-spoken woman. For anyone with five children to be soft-spoken - wow - isn't that just a complete freak of nature!! That's right, Mrs. Boice and her husband Carl, had five children: John, Carl Jr., Kurt, Kathy, and Jackie. We knew all of the kids. Kathy, who was about five years older than me - well - I worshipped her. I thought she was beautiful and kind and model-like. John still lived at home although he seemed to not be there much and Carl Jr. and Kurt came around enough...in fact, one of them lived in a house down the road. My dad was friendly with Carl aka Mr. Boice. I'm not sure how their friendship started but I know that beer was involved. My mom tells me that Joahn kept to herself. She didn't seem to have any friends but she was always friendly to everyone she came into contact with. I always thought it was odd that my mom and her weren't close friends given that we played with her daughter, we lived across the street, and my dad hung out with Carl. Now I understand why. Although I remember Joahn being pretty, and I can see her standing at the back porch handing us Popsicles or giving us pies to take home to our family, I have absolutely no recollection of her face. I can see her body, I can see her hair, but the rest has been blurred in my memory. My sister and my mom tell me that daughter Kathy looked very much like her mom. When I came into the house that Tuesday, in November 1973, my sister was already home (she only had half-day kindergarten) and my mom was in the kitchen. I asked my mom why there was an ambulance in front of Jackie's house. Was somebody hurt? Her face was solemn and she tried to change the subject. But me, never to be derailed by wanting to know answers, asked her again. She said that it had been there since 1pm and that she knew that Jackie's mom had been hurt. I needed more information. My mother calmly sat me down and said that there had been an accident. Mrs. Boice was up in the attic cleaning while little Jackie took her afternoon nap. My mom said that she didn't have all of the details but she had been told that a gun had accidentally been discharged. I ran back to our front entrance area and pulled the curtains open to see what I could see? Was Mrs. Boice alright? Where was Jackie? And Kathy? And Mr. Boice? My mom made me get away from the window (staring wasn't nice ya know!) and I spent the rest of the evening, fretting over the Boice's. I know that my dad talked to Carl. I know that my mom and dad whispered a lot in the kitchen (without me or Patty) that night. Eventually, they did tell us that Mrs. Boice had died and I remember crying myself to sleep that night, with the pillow covering up my whimpers as much as possible. I had to be strong for my sister. The funeral was held three days later - at D.O. McComb & Sons. Mrs. Boice was later buried at Covington Memorial Gardens. She was only 38 years old. I've mentioned before that our neighborhood was close-knit but the odd thing about this situation is that absolutely NO ONE talked about it. It's like the entire situation never occurred. I was intuitive enough (yes, even at seven) to know not to ask Kathy or Jackie questions but it always weighed heavily on my mind. Why was there a gun in the attic and how could Mr. Boice have been so irresponsible as to have left it out where Mrs. Boice tripped (this was my theory) and accidentally shot herself? Years later, my mom had told me that Mrs. Boice had purposely taken her life...using a rifle. She went up to the attic, we assume, so that Jackie would not be the one to find her. Almost every time I feel the first Fall chill in the air and/or the first grey Fall skies of the year, I often think of Mrs. Boice. I wonder what made her climb the stairs of the attic, take that rifle, and end her young life in the most gruesome of manners. I wonder if she was depressed for a long time or if something recently had happened to make her feel such despair. I wonder if she even understood that she would be leaving her five, beautiful children...motherless.